Health awareness has risen in recent years, but do we really know how safe what we consume is? Saudi director, actress and healthy living advocate Reem Al-Habib, a passionate supporter of clean eating, makes a point of educating herself and others about what she and her family consume through her various social media channels. Al-Habib, who trained as a lawyer, has starred in a number of TV shows on television networks and even in feature films. She is a strong advocate of women starring in Saudi Arabia’s rising film industry and her passion for clean eating is just as strong. “A good friend of mine hated eating vegetables and always complained of hair loss. 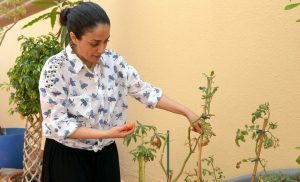 I tried to encourage her to grow her own plants but she went for the easier option, buying from the market,” Al-Habib told Arab News.